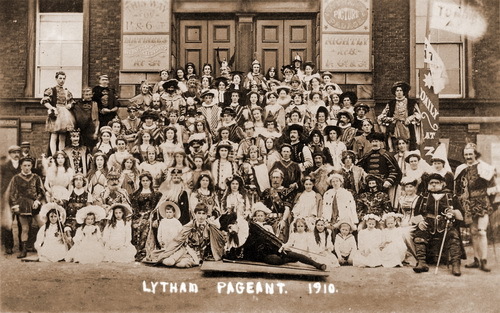 Newspaper report on Lytham Club Day Shakespearean Pageant, 1910. The idea of crowning a pretty young maiden as Queen of the Roses is prettily poetical, but for complete success in carrying it into effect in the open-air we need many conditions, the chief being the ideal June weather. Lytham supplied all the conditions save this at its annual festival on Monday. Lytham Club Day is an aggregation of many interesting events, and provides an interesting two days for the holiday-maker. There is the ceremony of crowning the Rose Queen, the old-time institution of the club walk, a picturesque children's pageant, and an athletic meeting. These functions take place in a beautiful old-world resort, where the softening hand of time has removed the hard and bare appearance of our modern towns, and where, luxuriant foliage and velvety lawns made a reposeful background. It was very unfortunate that for two years in succession heavy rain should have marred the efforts of the committee, and it was uncomfortable for the thousands who had flocked into Lytham by road, train, and tram, and who lined the streets. Last year's experience was vividly recalled, for as the procession was well on its way a heavy shower of rain fell, dispersing the crowd and the procession alike to the nearest available shelter. Smiling June became transformed into weeping April, and, the Poses, instead of shedding perfume on the air, shed tears on the ground. This rain was doubly distressing, inasmuch as the pageant promised to exceed in beauty anything attempted in previous years. In addition, to the civic authority, the friendly societies, turnouts and comic objects, there was also a Shakesperian (sic) character section, with three Shakesperian tableaux, some sixty or seventy characters being represented from twenty plays. Some of the characters were mounted, and the picturesque dresses of a bye-gone age added a warmth of colour and a gaiety that contrasted well with the pastoral suggestion of the Rose Queen's train. The Rose Queen—Miss, Florence Clarkson--and her maid of honour were seated in a florally-decorated phaeton, instead of a triumphal car as in past years, and though the beauty of the Rose Queen's court was diminished, it saved them from a drenching. The Rose Queen was attended by Misses L. Waterer, A. Whiteside, E. Wilsdon, P. Birley, S. Haynes, G. Cross, M. Cookson, G M. Layton, and D. Grigg as bridesmaids. A pretty scene was provided by the retiring queen, Miss Mary Blacoe, of Warton, who was accompanied by Miss Beatrice Singleton as a maid. After the rain the procession was re-formed and after parading the principal streets arrived at the beach, where the crowning core. many took place. Thousands assembled on the beach in front of the Assembly Rooms. Mr. J. T. Clifton presided at the ceremony, and a pretty picture of sweet youth and venerable age was presented when Mr. Wykeham Clifton, after crowning the Queen amidst applause, followed his gallant custom of bestowing a kiss upon the new Rose Queen. The afternoon pageant, in Lowther Gardens, was a brilliant picture, and the only thing lacking, was the kindly sunshine. 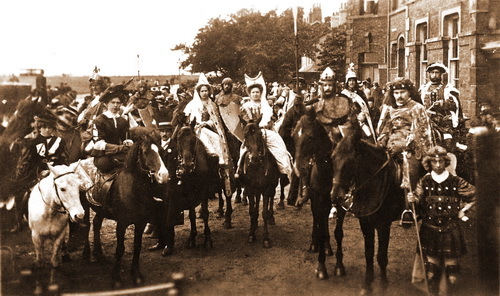 A procession was formed at St. John's School, by the children of which school then proceeded to Lowther Gardens. At the western end of the gardens large stands, artistically draped with muslin, were erected under the shelter of the broad belt of trees. There was a large assembly to witness the incident of the pageant, for which the beautiful background was so admirable a setting. After the musical acclamation of the Rose Queen, the new queen was received by her Predecessor and led to the seat of honour, and festivities commenced. Pretty dances and action songs, representing national characters and nature features, formed an important part in a constantly moving mass of colour. Shakesperian tableaux were introduced, and the old-time costumes were a prominent feature in the display. During the afternoon Mrs. Clifton, who was accompanied by Mr. Clifton, presented souvenirs to the Rose Queen and the retiring Rose Queen. She was introduced by Mr. J. Cockshutt, chairman of the Urban District Council, who referred to Mrs. Clifton's interest in Lytham and in that festival. In responding to a vote of thanks, proposed by Mr. E. R. Lightwood, vice-chairman of the Council, and seconded by Mr. W. Embley, chairman of the Festival Committee, Mrs. Clifton expressed her pleasure at being present. She added the hope that the Rose Queen would make the most of her opportunities during the year and urged the boys to become boy scouts and the girls to read poetry or take an interest in flowers, or any thing, in fact, so long as they did something which was useful. The arrangements for the two days were admirably carried out by the chairman (Mr. Embley), the vice-chairman (Mr. George Moore), the :hon. secretary (Mr. W. Draper), and the hon. treasurer (Mr. H. T. Marsden), and the members of the committee. The hon. secretary for the children's pageant was Mr. J. A. Collinson. Mr. H. Hoyle was the conductor and pianist. Tradesmen's Neatest Turnout.-1 H. Snalam; 2, Market Hall Meat Supply do. ; 3, W, M. Edmunds. Tradesmen's Exhibits.-1 H. Johnson; 2, Wigan Coal and Iron Co.; 3, J. Sutton. Neatest and Best Decorated Heavy Turnout. -1, Wigan Coal and Iron Co.; 2, H. Johnson; 3, G. Richards and Sons. Neatest and Best Decorated horse and Linty for School Children. —.J. Macdonald. Neatest Donkey and Rider -1, 2 and, 3, G. Elston. Errand Boys' Neatest Turnout. --1, Clarkson's Dairy ; 2, D. Leigh.